Here at IronSocket, we work to continually raise awareness of the threats that we as individuals face in our connected lives. We are 100% committed to helping our customers stay safe and secure while on-line, both through our VPN and proxy services as well as through education. Here are the top articles we have plucked from last week’s news tsunami. Planning on doing some traveling this season? Beware the public wi-fi my child. The jaws that bite, the claws that catch! Here are three very good and very quick pieces of advice to heed while on the road, whether around the globe or just down to your corner coffee shop. No, seriously! Really beware of unprotected public wi-fi! This article is about a hacker group that specifically targets hotel wi-fi. It serves very well to illustrate the first line of cyber-defense must be your brain. Don’t let the hair of the guy in the video distract you. There is an important and useful message here. I’ve tried several password managers and without any doubt, my personal favorite is LastPass. The right password manager can take almost all the hassle out of logging in to accounts across multiple devices. And FruitFly likes to watch. But who is behind this disturbing malware? Is it a single organization or are more than one involved? It’s good to keep your anti-malware up-to-date. At one end of the spectrum are the lone-wolf hackers. At the other end are governmental cyber-warfare units. And in the burgeoning middle are the people running their dark web operations as a for-profit business, selling and supporting products and services. That’s all for this week. As always, if you have any questions or comments, don’t hesitate to write to us. We’re here to help you stay safe, secure, and protected while online. Every Monday we’ll be bringing you a review of the pervious week’s hottest cyber-security and on-line privacy news articles. Here are the top articles we have gleaned from last week’s news avalanche. It used to be that, security-wise, us Mac users didn’t have anything to worry about. That has changed now. This new strain of the OSX/Dok malware will infect your Mac, pretend to be a bank website, and capture your bank account user name and password. And, to protect itself from being discovered, it will disable security updates and block traffic from being sent to Apple’s servers. How does it do this? Read the article to find out. Anyone who has 13 bucks U.S. and the chutzpah to venture into the dark web can buy the Ovidiy Stealer. It will help if you can read Russian but other than that, that’s all you need. This malware runs on Chrome and Opera and it steals passwords. Purchasing it gives you a dashboard where you can monitor your victims’ activities and even get technical support from the author of the malware. Malware distribution and use as a business is a real thing. Let’s say you’re a hacker who wants to target a specific organization. This organization has pretty good cyber security. So, what do you do? You get someone on the inside to unknowingly do your work for you. Think U.S. presidential campaigns and the Democratic National Committee. Phishing scams attack people, not computer systems. Find someone who works for your target organization and who also has a good chunk of personal information on social media. Once you know some details about this person, you can tailor your phishing attack so it seems completely legit. People who write software hate to “reinvent the wheel.” So, if there is a collection of resources (a library) that contains bits of ready-to-use software (functions, objects, classes, etc.) that you need for the application you’re developing, you’ll want to go with that, rather than writing your own from scratch. And if it’s open-source and freely available on a public software repository, it’s a no-brainer. The problem is, if there is a bug in one of these resources, and companies all over the globe are integrating this flawed resource into their products, well, you get the picture. Speaking of the IoT – Think of the children! We know it sounds cliché, but cyber-security and on-line privacy begin with you. That’s all for this week. As usual, if you have any questions or comments, don’t hesitate to write to us. We’re here to help you stay safe, secure, and protected while online. Internet freedoms are being threatened globally. This is true for even the United States. If you’re a U.S. citizen, living at home or abroad, this is relevant to you. Currently, the FCC is required to ensure that all Internet traffic is treated equally. Internet service providers are not allowed to favor traffic from some websites over others. The FCC, under the direction of the current administration, is proposing to reverse these net neutrality guidelines. This would allow ISPs to control what passes through their networks. They can speed up traffic from favored websites and from websites that pay for high-speed channels, slow down traffic from websites that don’t or can’t pay for high-speed, and even block any website they want for any reason. The Electronic Frontier Foundation has called for July 12th to be a day of protest. Hundreds of websites for non-profit organizations, artists, small businesses, tech companies large and small will be taking action to defend net neutrality and an open Internet. The goal is to send a strong message to Congress and the FCC: Preserve Title II of the Communications Act and net neutrality. You can help too. The EFF has a web form for submitting comments to the FCC. It’s quick, easy, and every bit helps. Add your voice to the call to preserve Title II, net neutrality, and Internet freedom. Visit the EFF’s Save Net Neutrality website and submit your comments today. We are pleased to announce that we are extending our first annual Independence from Snooping Day sale to the end of July! Existing subscribers and new users can now save 40% on the already discounted annual subscription rate. 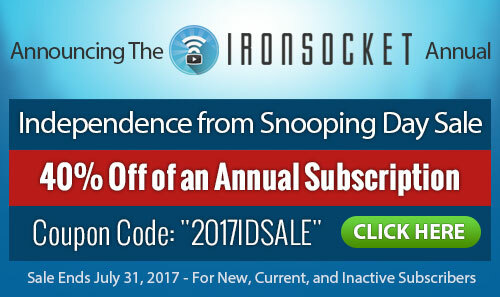 Existing subscribers need to be logged into their account and go to https://ironsocket.com/pricing, then pay like you normally would using the coupon “2017IDSALE” on Step 3 of the payment process. Once you have paid, please contact customer support and they will manually update your current subscription. This sale will end on July 31, 2017. We are continuing to improve and refine our all-in-one custom application for Microsoft Windows systems. We’ll be releasing a new version of the beta soon. We’ve fixed the bugs we’ve discovered since the previous release and we’ve added some extra features that have been requested by subscribers testing the application. If you have a Windows system and you haven’t yet tried it, you should have a go at it. Log in to your account on ironsocket.com and click on the Windows Beta button. Follow the prompts and instructions and you’ll be all set.